Another engine I have recently purchased was a Mamod minor engine. The problem I have found with naming this engine is that I don't know whether its a Minor 1 (MM1) or Minor 2 (MM2) because after researching both engines, I still can't decide which is which! It is clear the engine has been up in someone's loft for a few years rusting away. Everything is present thankfully: the only problems are with the tarnishing boiler and rusty boiler box. This means everything will need respraying and polishing. Quick Restoration Tip: If you are restoring an engine yourself, remember to always put all parts of the engine in a see through bag to store. The last thing you want to do is lose parts when taking apart the engine! This engine has nothing serious with it so it should be quite a nice restoration to do. Keep updated at restoringmamods.com to see the article of the engine fully restored! What Fuel Can Be Used For a Mamod Steam Engine? If you want to share your Mamod experience or write an article on Mamod steam engines on RestoringMamods.com, feel free to use the contact form to do so. 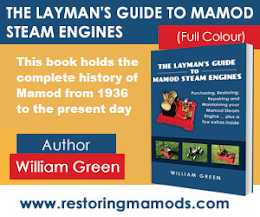 Restoring Mamods is a website designed and created by Will Green who restores and refurbishes Mamod steam engines to their once former glory. His aim is to spread the Mamod brand and recognize that Mamod steam engines from the past can still give people many hours of enjoyment today.